Colonel Larry Broadwell, Beale Air Force Base Commander, above, is interviewed about yesterday’s fatal crash of FAS (1st Recon Squadron) U-2 “Dragon Lady” 32 miles Northwest of Beale AFB, North of Sacramento, CA. One pilot was killed and the other seriously injured. Their names will not be released before next of kin are first properly notified. Video is 1:01 in length. Above video features active FASF member and FASF Advisor, former First Aero Squadron Commanding Officer at Beale Air Force Base until 2013, LT COL Chi Chi (Steve) Rodriguez. Video is 8:00 min duration. 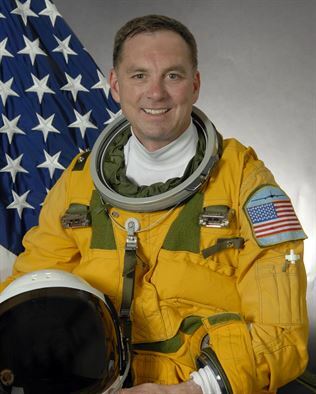 The deceased pilot (above) involved in a U-2 Dragon Lady crash on Sept. 20th, 2016 has been identified as Lt. Col. Ira S. Eadie. Eadie was assigned to the 1st Aero (Reconnaissance) Squadron, Beale Air Force Base, Calif. and was on a training mission with another pilot when the two-seat trainer version of the famous U-2 spy plane crashed. The other pilot sustained non-life-threatening injuries and is in good condition at a local medical facility. 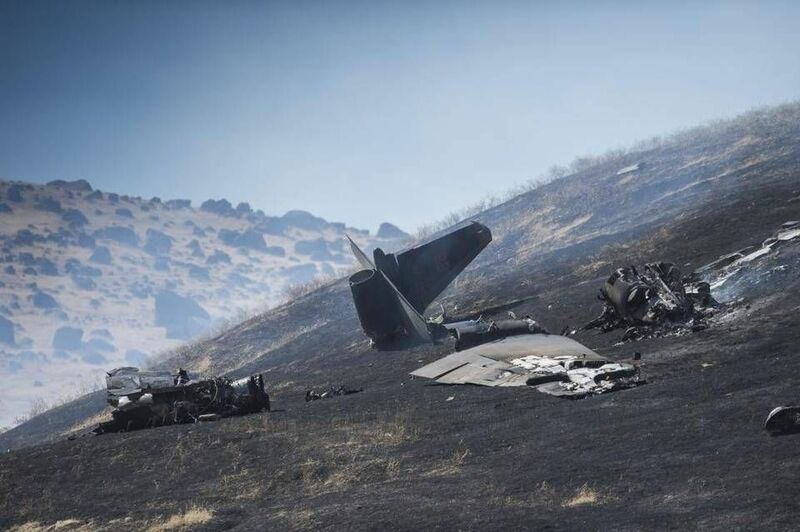 A pilot from Beale Air Force Base (BAFB) was killed and a second was injured Tuesday after a U-2 spy plane, one of the most famous aircraft of the Cold War era, crashed Tuesday morning near the Sutter Buttes. As soon at the FASF learns the names of those involved, it will add them to this story. The pilots, participating in a normal training mission, ejected from the especially designed two-seater version of the aircraft before it plunged into grassy hills in Sutter County, which is the country immediately North of Sacramento and directly west of Beale AFB, which is in Yuba County. The crash set off a 250-acre wildfire. Fire crews sped to put out the blaze as search and rescue teams searched for the pilots in remote terrain. A local and airborne crop duster pilot saw the accident take place and immediately reported it to authorities. “We are still working to make access to the patients to (determine) how we are going to get them out of the area they are in,” said Sutter County Fire Chief John Shalowitz early Tuesday afternoon. The Air Force confirmed shortly afterward that one pilot was dead. Shalowitz said 20 engine units responded to fight the fire, which was set off in hot conditions with a 20 mph breeze. Near the crash site, a smoldering wing, fuselage and tail of the aircraft were visible. The fire was fully extinguished later yesterday afternoon. Crash site after flames extinguished by Sutter County Fire Department. U-2 Tail, part of right wing and engine are seen. Air Force Chief of Staff Gen. David Goldfein, at the Pentagon in Washington, posted on Facebook that he was “deeply saddened” by the death of the pilot. “We offer our deepest condolences to the Airman’s family and to all who are mourning this tremendous loss,” he said. The aircraft was assigned to the 1st Aero (Reconnaissance) Squadron, part of the 9th Reconnaissance Wing at Beale Air Force Base, where U-2 fleet is based and its 33 planes are deployed to military detachments around the world. Over 1,000 personnel work on the U-2 program at the base near Marysville, CA. As most of this story’s readers know, the First Aero Squadron out of Beale AFB is the same unit that flew its reconnaissance missions out of Columbus, NM a century ago in pursuit of Pancho Villa, after his raid on Columbus March 9, 1916. The U-2, a sleek black jet known as the “Dragon Lady,” became known for an international incident in 1960 when American Capt. Francis Garry Powers (who was working for the CIA at the time) was shot down and taken prisoner after flying surveillance aircraft over the former Soviet Union. The U-2 also gained fame for uncovering secretive Soviet launch site in the Cuban Missile Crisis of 1962. Before the U-2 had been shot down, President Eisenhower had repeatedly denied we were overflying Russian airspace with a spy plane, so the incident was a major international embarrassment for the Administration. Since that time, the U-2 spy craft has continued to play a critical military role, collecting imagery and electronic measurements on surveillance flights targeting terrorist networks in the Middle East. The actual new U-2 Airplane is some 33% larger than its early Cold War predecessor, and has a much more powerful engine, so can take much heavier payloads on its missions, which go as high as it’s officially published service ceiling of 70,000′, but it is well known by aviation authorities that it can go above this publicized lower altitude, which is nevertheless still almost into outer space. It’s high altitude operations require its pilots to wear suits almost identical to those worn by astronauts. While the military says the cost of a U-2 is classified, the military information site Global Security.org puts the price tag of the current model U-2 at $400 million. In 2012, the Air Force said it had spent $1.7 billion over eight years to modernize the aircraft with new flight and surveillance technology. The maker of the U-2 is Lockheed Aircraft Corporation. The Air Force has long planned to replace the U-2, normally flown with one pilot, with unmanned RQ Global Hawks, remotely controlled aircraft first deployed by Air Force in 2001. The Global Hawks are also stationed at Beale, from which they fly thousands of miles, sometimes on the other side of the world, to pinpoint human targets for armed Predator and Reaper drones. The U-2, celebrated in the recently released (2015) movie “Bridge of Spies,” (previously featured in this FASF Website) has been a point of pride for the Beale Community, with the longstanding program also seen as an important economic resource for the region. This Spring, area Republican Rep. Doug LaMalfa offered a budget amendment to keep the U-2 operating at Beale through 2017. “We want to make sure it stays there. . . It’s important for Northern California with the number of people employed at Beale Air Force Base,” LaMalfa said in a May interview with KNCO radio in Grass Valley. Col. Larry Broadwell, Commander of the 9th Reconnaissance Wing at Beale, gave tribute to the U-2 program at a press conference at the base Tuesday (yesterday) afternoon. He described the day as an emotional one. “I would match the safety and maintenance records of a U-2 with any other aircraft the Air Force flies. In fact, we are going to continue flying U-2 missions around the world and around the clock,” said Broadwell. He said Air Force officials were reaching out to family members of the pilots, who were not identified. It was not the first time that a Beale U-2 has crashed in Northern California. Pilot Randy Roby‘s U-2 spy plane fell from the sky in 1996, crashing into a parking lot next to the Mercury-Register newspaper in Oroville. Roby ejected from the plane but was found dead in his seat at the end of the parachute. Geraldine Marie “Jerri” Vering, 49, of Oroville, a customer who had just finished renewing a subscription at newspaper offices, was killed on the ground. The last fatal accident involving a U-2 pilot took place in 2005, when one of the aircraft crashed near an air base in United Arab Emirates. That accident killed Maj. Duane Dively, a pilot from Beale Air Force Base who was deployed to the Middle East. He was returning from a mission flying over Afghanistan when he crashed. More recently, the Air Force had expensive U-2 mishaps in both 2014 and 2015. Those so-called “class A” mishaps are accidents that cause more than $2 million in damage or cause a permanent injury to an airman. One class A mishap took place in each of those years, according to records kept by the Air Force Safety Center at Kirtland Air Force Base (KAFB) in New Mexico. Keith Wright, a public affairs officer for Air Force Safety Center, said Tuesday’s accident would trigger an investigation seeking to identify “the root cause” of the crash. The board is expected to consist of officers from Beale Air Force Base and from the Air Force Safety Center, which oversees all inspection and safety functions for the Air Force. 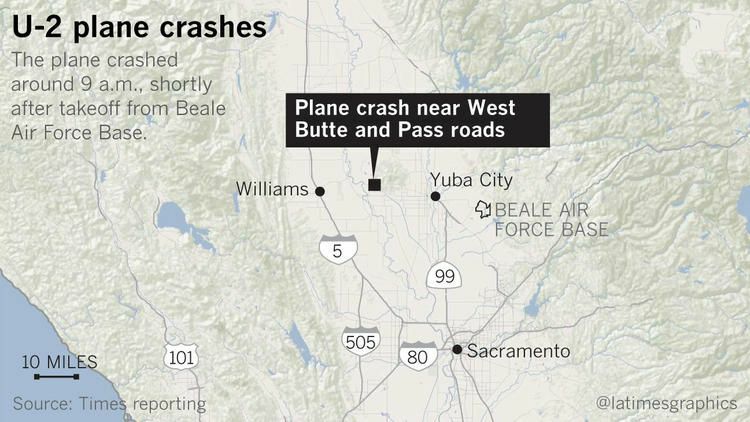 The above story was put together from data and other specific details revealed in various news releases from the Sacramento Bee; the UK’s News Now Aviation Accident Department; Military.com. ; Los Angeles Times; and from the Public Affairs Office at Beale Air Force Base, home of the present day First Aero (Recon) Squadron.